Anyone got 15 to 30 minutes Spare Time? Need a favor! 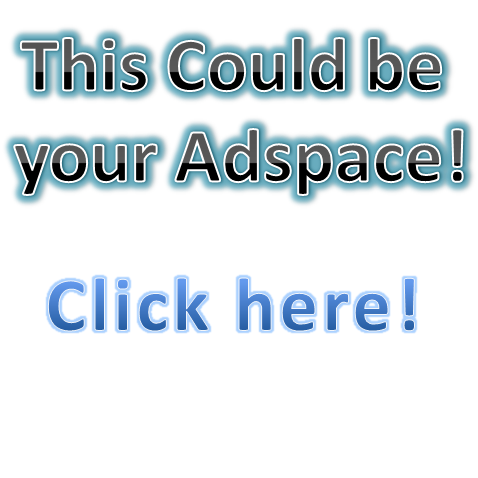 I was wondering if someone would like to create me an advertisement that I can place on my homepage advertising to selling adspace. The banner should be the approximate width or smaller than my page (NOT LARGER) and should indicate there is adspace available, click here to apply. I'd like one that is appealing - hopefully with lots of graphics/animation but not too much. Don't worry about a link in the banner, I'll add the link through my site builder. I'm not too good of an artist when it comes to these kind of banners. If more than one person wants to help, I'll chose the one I like best or maybe I'll use them all and post 'em on different pages around my site. I also don't have good software currently on my computer, paint and ms office is about it. If you can, try to make it blend in with my site - chose colors appropriately! http://sitebuilder.yola.com/sites/D7d... ... tell me what you think. I created this is MS Excel and then I copied into paint, saved it, then uploaded to yola and croped it down to size. I plan on putting a link in the image so that it takes the person clicking it to a 'form' to apply for advertising. But I still need to know the scope of selling adspace. Would it be a horizontal or potrait banner? I am very interested in designing one for you. Righty I just scrapped this together. Give me feedback please. it's very nicely done, but I'm not sure I want to use that large of space. Unless you have opinions of where I can put it!!! take a look at the homepage and tell me what's a good idea!!! I like it though, better than I can do since I don't have much software on my computer since I reinstalled windows. I actually reinstalled windows this week too, while I weave my way through the Adobe website to get Photoshop. I use Paint.net its free and very nifty. 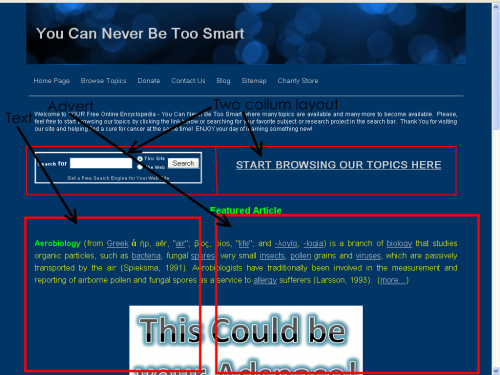 go check out my homepage... http://youcanneverbetoosmart.synthasi... ... I'm not sure if the white background is suppose to be there... but that's what I got! What do you mean "Large of space" Do you mean how big it is? Cant you resize it? I wasnt expecting for you to use it at that size, hehe. I could probably resize it, but then it's probably going to make the letters too small or blurred. I would think! ok, I was mistaken. I just resized it and it looks really good. I'm going to use it. :) Now I just have to create my form and connect a link to the ad. Can I create a form whereas a credit card card purchase is linked to it. Instead of the only route I know is to fill out the form and then separate from the make the purchase. Like a credit card processing that allows you to create a custom form for the purchases. Paypal doesn't seem to have this option (although they might that I'm not aware of) and I've never used google checkout if you know anything about them or any other services? The beuty of .PNG`s never go wrong do they. Good old Pings! umm... I was thinking about trying a vertical one. but you can submit a few and I'll chose or maybe be able to use them all. Did you check the one I did? That just took me three minutes. If you can create one with additional graphics or looks I'd appreciate it. What I would really like is some animation but not sure the best way to do that. Like getting the Advertise Here to fly into the banner, that would be cool. Sorry cant help you mate, I do not have any animation editing stuff yet! I can create excellent animation and stuff through powerpoint, but not sure if I can get something from there into the website. Donald - i could make you something out of flash - but i dont have time tonight... take a look at this and tell me what you would want to be different - it only took 5 minutes so your not going to hurt my feelings :) - tell me what you would do different and i'll knock you 1 up tomorrow. I can't seem to right click and save this to my computer. Can you send it to me in a format I can upload to my file manager? Ahh thats the problem, you cant. Its flash. as far as I am aware you cant copy flash. But you could just script it in using HTML. yep that's true... DUKE? You have an html for this? Donald, here is what I think the layout should be like. Tell me in the morning if this works out.